Electronic discovery (e-discovery) in India has still to be considered as an essential part of analysis and investigations. In western countries, e-discovery is well adopted and used. Indian jurisprudence regarding e-discovery is still maturing. We have no dedicated e-discovery law in India. However, e-discovery laws and practices in India need to be developed because in future the same is definitely required to be taken into account for multiple purposes. While e-discovery in India and its uses are still in infancy stage yet electronic discovery (e-discovery) services in India are flourishing. For instance, e-discovery and litigation services LPO and KPO in India have good scope as work and assignments from western countries is outsourced to India. Realising the potential of e-discovery related LPO and KPO services in India, many LPO firms are now exploring this area. However, there is a practical difficulty for traditional LPO firms and companies as a shift to e-discovery and litigation services in India requires techno legal expertise. There are very few LPO and KPO firms and companies in India that can provide techno legal e-discovery services in India. This is also the main reason why e-discovery and litigation services in India are still in infancy stage. So far, Perry4Law Techno Legal Base (PTLB) is the exclusive techno legal e-discovery related solutions and litigation services provider in India. PTLB is also managing the exclusive techno legal digital evidencing and e-discovery centre of India. In order to develop e-discovery related practices in India, legal and judicial fraternity of India needs a temperament for scientific knowledge. Further, technology must be used for legal and judicial purposes in India. For instance, we are still waiting for the establishment of first e-court of India till December 2011. In fact, we have a single techno legal e-courts training and consultancy centre of India managed by PTLB. On the front of alternative dispute resolution as well India has performed poorly. For instance, online dispute resolution (ODR) in India is still missing from adjudicatory machinery of India. E-discovery would be an essential part of adjudicatory and litigation services in India in near future. Adjudicatory mechanisms like cyber appellate tribunal (CAT) of India, e-courts, ODR, etc would further increase its use. Time has come to make e-discovery as an integral part of every organisation in India that deals in technology. Legal research is of paramount importance for the successful completion of any law related assignment. Whether it is the internal requirement of a company or a court case, a proper legal research is the foundation for the successful outcome of the same. Legal research a tedious job that requires great deal of expertise and knowledge. Legal research is also an expensive task hence most of the developed nations outsource the same to developing countries like India. Thus, legal research has become an important and indispensable part of legal process outsourcing in India (LPO in India). A good LPO services provider must be well aware of the legal systems of various jurisdictions so that it can advice properly upon complicated legal issues arising in concerned jurisdiction. 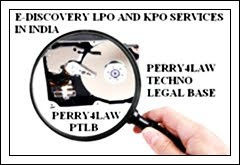 At Perry4Law and Perry4Law Techno Legal Base (PTLB) we provide the exclusive techno legal LPO and KPO services in India. This allows us to provide legal research services to individuals representing different jurisdictions. These services are unique as they are exclusive techno legal LPO and KPO services in India and world wide. Issues like cyber law, cyber forensics, cyber security, digital evidencing, e-commerce, e-governance, digital services delivery, e-courts, etc are difficult to analyse as they are techno legal in nature. At Perry4Law and PTLB we specialise in providing techno legal research, LPO and KPO services. We are expanding our horizons further and in future we would cover many more areas that very few dare to cover. Legal process outsourcing in India (LPO in India) has matured to a great extent. There are many players in India that are providing LPO services in India. Some of them are proper legal professionals and institutions whereas others are simply commercial companies that have also expanded their businesses in the field of LPO. LPO services include a wide variety of fields. These include legal research, case briefing, para legal services, documents management, case research and study, etc. While the cost of such services in US and other jurisdictions is considerably high, the same services are provided in an economical manner in India and other designations. With the changing landscape of the LPO services, LPO services providers in India need to change their strategy and business model. For instance, there are almost no techno legal LPO service providers in India. Of course, at Perry4Law and Perry4Law Techno Legal Base (PTLB) we provide the exclusive techno legal LPO and KPO services in India. Our highly sepcialised techno legal LPO and KPO services cover areas like cyber law, cyber security, cyber forensics, digital evidencing, e-courts, techno legal research, etc. Before choosing a LPO services provider in India, the concerned person must analyse the veracity and reputation of the chosen LPO provider. It is of paramount importance that such person must choose a LPO service provider who can perform the assigned task in an economical, efficient and timely manner. Outsourcing industry is witnessing many ups and downs in India. This is natural in a dynamic environment in which we live today. However, information and communication technology (ICT) related outsourcing issues are posing the biggest challenge before the outsourcing industry of India. Indian outsourcing industry carries on business process outsourcing (BPO), legal process outsourcing (LPO), knowledge process outsourcing (KPO), etc. However, technology related LPO and KPO service providers in India are just handful. At Perry4Law Techno Legal Base (PTLB) we are managing the leading techno legal LPO and KPO services in the world. A techno legal LPO and KPO platform is different from a simple LPO and KPO firm in the sense that it caters the requirements of both law and technology. Techno legal LPO and KPO services are in much demand for ICT related industries, ICT litigations and consultancies, etc. A typical techno legal LPO or KPO would provide services in the fields of cyber law, cyber forensics, e-discovery, digital evidencing, techno legal dispute resolutions, cyber due diligence, etc. As far as e-discovery related litigation, LPO and KPO services in India are concerned, they are managed by just one or two LPO and KPO providers. This is so because we have no e-discovery laws and regulations in India. In the absence of such legislations and public awareness there is very less demand for e-discovery related LPO and KPO works from India. A dominant majority of e-discovery related work comes from foreign jurisdictions where technology related laws are well placed. Similarly, techno legal e-discovery LPO and KPO also requires domain specific expertise that is not easy to acquire. This is another reason why most of the LPO and KPO providers in India do not provide e-discovery related services. However, India is paying attention to regulatory issues of ICT and more demand for e-discovery related LPO and KPO services would arise in future. It would be better idea if LPO and KPO providers in India develop good e-discovery related expertise till then. Knowledge process outsourcing (KPO) is a field that requires tremendous expertise and specialisation. While the business process outsourcing (BPO) can be successfully carried out with little expertise, KPO on the other hand requires domain specific expertise. This is the reason that very few KPO providers are available for domain specific KPO services in India and world wide. KPO in India has yet to pick up the speed. While LPO and KPO in India are witnessing a tremendous growth yet Techno Legal KPO in India is almost missing. At Perry4Law and Perry4Law Techno Legal Base (PTLB) we provide world class Techno Legal LPO and KPO Services. We also have the privilege of being the Exclusive Citizen to Government (C2G) LPO and KPO Provider of India. Two of our “Exclusive Specialties” are Techno Legal LPO and KPO Services and Techno Legal Innovative KPO Services. We provide KPO Services for novel Policy and Strategy areas that are still unexplored. Times again Governments around the World come across situations that require immediate, novel and suitable solutions. The Innovative KPO Services of Perry4Law meet these requirements. We provide unique Policy Formulation and Legislation Making Support to Governments across the World. Further, we also provide Techno Legal Support for Law Making and Training of Parliaments and Legislative Bodies across the World. Of course, qualitative services also come at a cost higher than traditional BPO services but for “High Value Projects” and where much is at stake, costs should not be the consideration. Perry4Law and PTLB also provided KPO Services along with Techno Legal Skill Development Trainings. Techno Legal Research, Training and Education are also the Specialty of Perry4Law and PTLB. Exclusive Techno Legal Cyber Forensics Research, Training and Education Centre of India and Cyber Security Research, Education and Training Centre of India are also providing Techno Legal KPO Services. In short, our “Core Strength” lies in Adaptability, Flexibility and Innovativeness. We see an enhanced role and activities in the near future and for the same we may need suitable Partners and Collaborators. Interested Persons or Institutions may send their proposals to us. 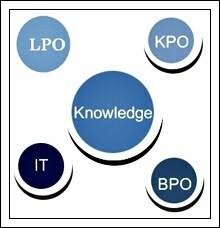 Legal Process Outsourcing in India (LPO in India) and Knowledge Process Outsourcing in India (KPO in India) are well known. The LPOs and KPOs in India operate in a wide variety of areas. Some of them are providing great services to their clients. However very few of them have explored the market for ICT related and Techno Legal LPO and KPO Services in India. For instance, if an assignment pertaining to Cyber Forensics or Cyber Security is forwarded to India, there are very few firms that can manage the same. Similarly, issues like E-Discovery in India are also managed few LPO and KPO Providers of India alone. Another area that very few KPO Providers can anticipate is the KPO Services to the Governments of various Nations and International Organisations and Institutions. Since these International Governments and International Organisations require Domain Specific and Highly Specialised “Knowledge Based Inputs”, the market for Citizen to Government (C2G) KPO is also emerging. In order to cater the C2G KPO needs of various Governments and International Organisations, Perry4Law, Perry4Law Techno Legal Base (PTLB), Perry4Law Techno Legal ICT Training Centre (PTLITC), etc have put in place various mechanisms. These Techno Legal Mechanisms are “Customised” in such a manner that almost all the Techno Legal Requirements of various Stakeholders are met properly. Perry4Law. PTLB and PTLITC are collectively providing the best and widest possible Techno Legal Policies and Strategies to the intended Stakeholders. Some of the areas where Perry4Law, PTLB and PTLITC provides their Techno Legal LPO and KPO Services include Cyber Law, Cyber Security, Cyber Forensics, Cyber Warfare, Cyber Terrorism, Cyber Espionage, Homeland Security, Internal Security, Digital Evidencing, E-Discovery, Cyber Due Diligence, E-Courts, National E-governance Plan (NEGP), etc. Besides, Perry4Law, PTLB and PTLITC also provide Techno Legal Trainings to Lawyers, Judges, Public Prosecutors, Police Officers, Corporate Executives, Law Graduates, etc. Perry4Law, PTLB and PTLITC are also managing the Exclusive Techno Legal Cyber Forensics Research, Training and Education Centre of India and Cyber Security Research, Education and Training Centre of India. Further, they are also managing the Exclusive Techno Legal E-Courts Training and Consultancy Centre of India. Another unique achievement of Perry4Law is establishment of the Exclusive Centre on the Protection of Human Rights in Cyberspace. Even the Exclusive India Centre for ICT in Parliament is managed by them. With the use of extensive Public Private Partnership (PPP) in India in future, the scope of C2G LPO and KPO Services is going to increase and Perry4Law, PTLB and PTLITC would play a decisive and major role in the development of this field in India and abroad.